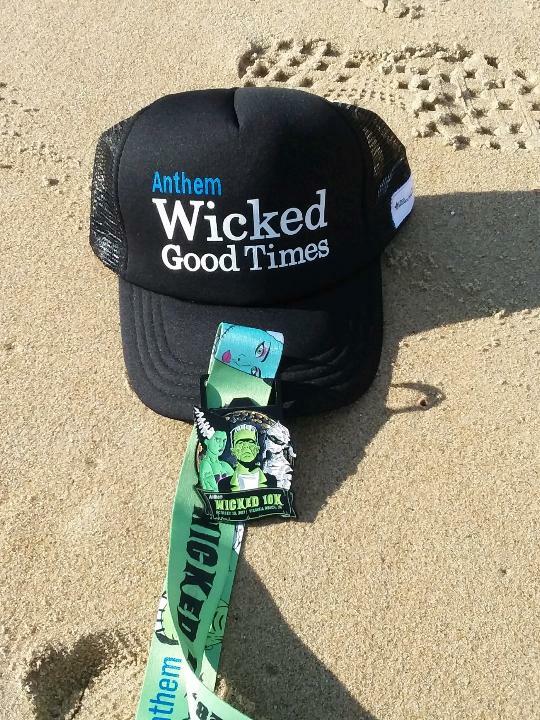 This past weekend I ran the Wicked 10k. I have run this race the past few years and it is always one of my favorites. 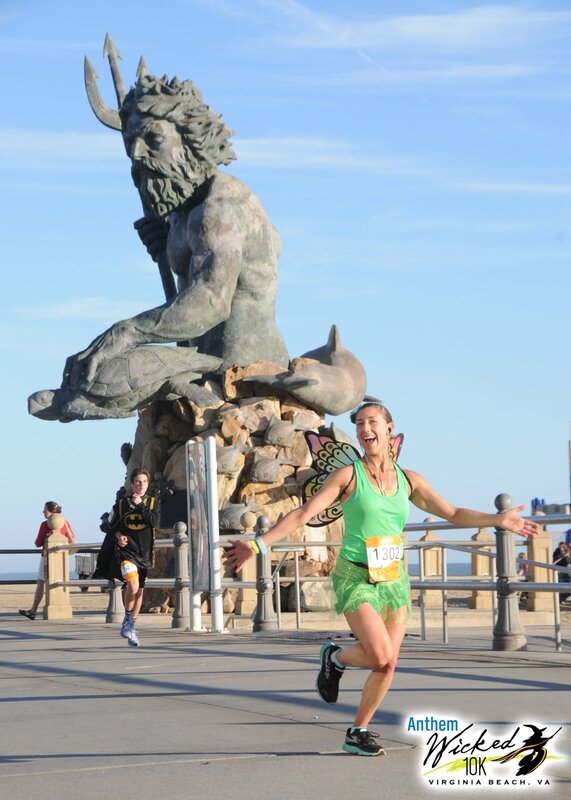 It is a race where people dress up and just have fun. Friday afternoon I went and picked up my race packet at the expo. This was a smaller expo compared to the other races that they put on. I had no intention of buying anything but I found my favorite socks there and they were buy one get one half off so I grabbed some Experia socks then I was on my way. The next morning I got up and put my costume on. I was hoping that I wasn’t going to be too chilly. I ate my English muffin and I was out the door by 7 am. The race started at 8 am and I thought I would have plenty of time since parking is never an issue. I parked at the convention center and met up with my friends. I walked in to use the restroom but the lines were way long. There was announcement that the dry bags had to be dropped off in 7 minutes. I knew I was not going to get through that line within that time so I headed over to bag drop off. I dropped my bag off and headed back inside. While I was waiting in the line, I realized I forgot to grab my Ipod out of my bag so I walked back to the truck and luckily my bag was right on top and I was able to grab them. By this time there was no time to wait in line for the restroom. I thought the line for the porta potties would be much shorter, but that was not the case. debating to wait in line and just start back a few corrals but then I thought well maybe this will just make me run faster and be done sooner. So I went into the first corral and we were soon off. markers but I was feeling good so I didn’t really pay attention to it. I passed some cool costumes when I was circling back through during the second half where we shared the road with the other runners going the opposite direction. All of the sudden I see this super hero (not sure which one) go flying by me almost sprinting. I thought to myself this guy is going to burn himself out. Not only was he sprinting, but he was in full costume from head to toe probably sweating to death. A few minutes later I passed him while he was walking. He must have lost all his power. About a half mile down the road he comes up behind me once again sprinting by. I thought is this how he does his run/walk intervals. So I passed him again when he walking and never saw him ever again throughout the race. Up ahead I saw this lady I thought I knew running at a pretty good pace. I don’t know her personally but I see her every weekend running in the park with her running coach that rides a bike beside her. And here I am passing her never having a coach. I’m sure she was just doing this race as a training run preparing probably for an upcoming marathon, but it did make me feel good passing her(Even though she is probably 15 years my senior). Soon we made the turn to go onto the boardwalk for the last mile. Here was where they were giving out pieces of Krispy Kreme donuts. Last year I remember taking some while I was running with my friend, but this year I was running by myself and I just wanted to finish. I was hoping that there would have some at the finish as well, but unfortunately there was none. 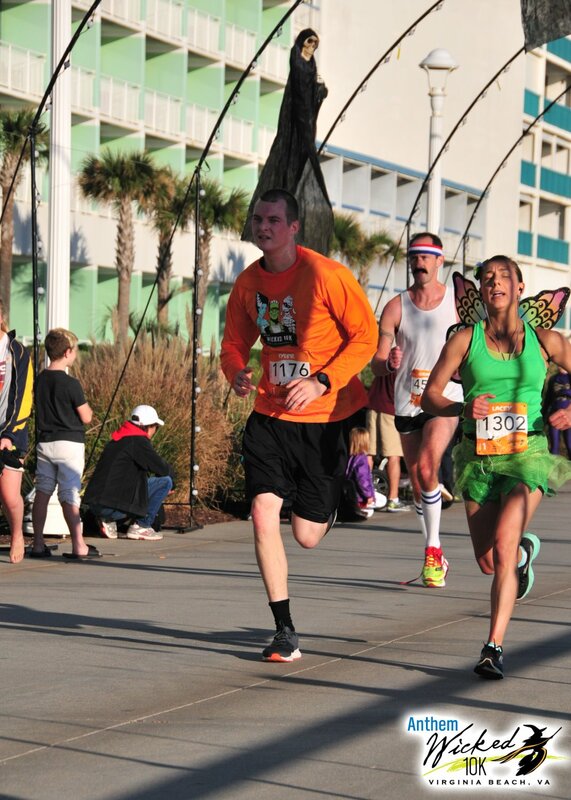 While running on the boardwalk you can see the finish line way before you are close to it. I knew I had some more pep in my step but wanted to wait until I came closer to the finish. I kept saying to myself this is only a quarter of the distance you ran last Saturday so there is no reason I can’t speed up a bit. 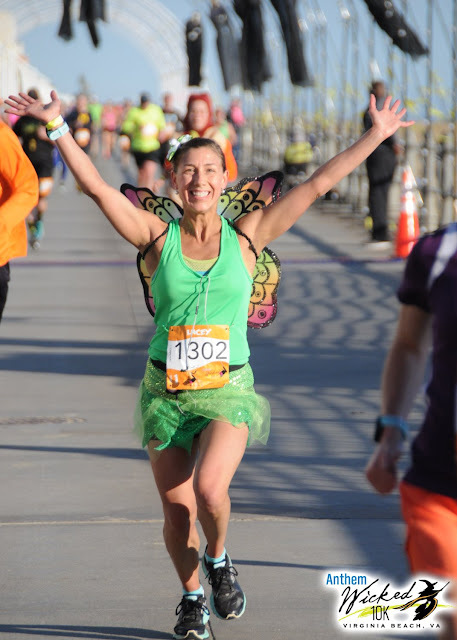 There were a few runners in my site that I was hoping to pass before the finish and I did just that when the time was right and crossed the finish line strong. Afterwards I looked down at my watch and I thought I may have hit a PR but can’t recall what my other 10k times were when I placed. If it was, it was only within seconds. I finished in 45:15 with an average page of 7:17. After I finished I hit the restroom finally then went back to the finish line to watch my friends finish. We enjoyed our celebratory beverages while listening to the band play on the beach and then watched the Costume contest. I saw this lady that wanted to get a picture with one of the winners so I asked her if she wanted me to take it. After I took the picture she asked me if I was Lacey. I said yes. I didn’t recognize her (mostly because she was in costume) but thought she may have been a follower on our blog. She told me her name and it clicked. 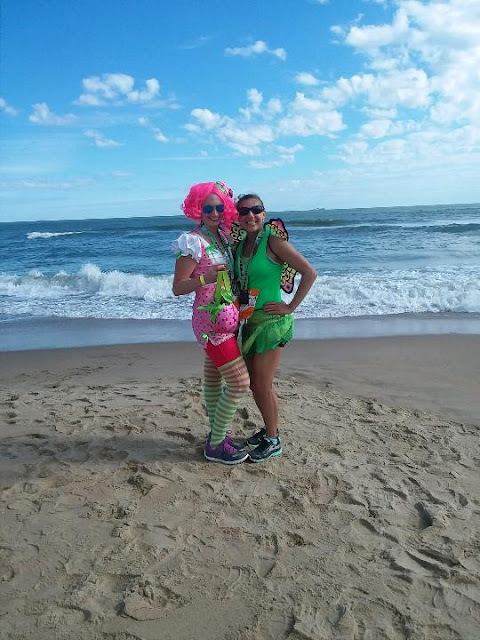 She was in my running group years ago when I first moved down to Virginia Beach. Since she has moved but not that far from Virginia Beach and says she still comes down for all the races. We caught up and she told me she’d look up our blog now that she knows we have one. 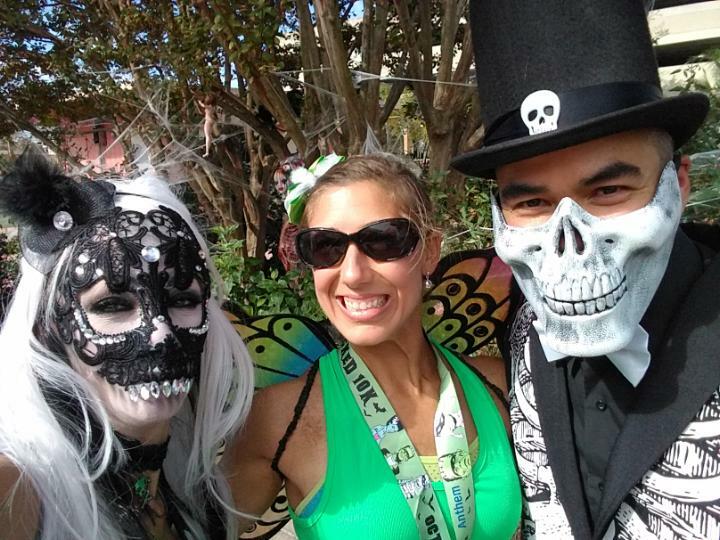 After the race I met some other friends out for some Halloween festivities. It was a great race and a fun weekend catching up with friends. The Goodies from this year. Thanks.It was a lot of fun. Sounds like you had a great race & what beautiful weather & photos of you! There was plenty of runners in all age groups that ran the race. So fun! Sounds like a really fun race, you got some great photos! I especially like that one with the statue in the background. Every tourist always has to get a pic by that when they visit Virginia Beach. I think it is pretty Iconic. Great job--what a fast race you ran! You look so happy in all your pictures. That had to feel good! They actually came out well which I was surprised to see. 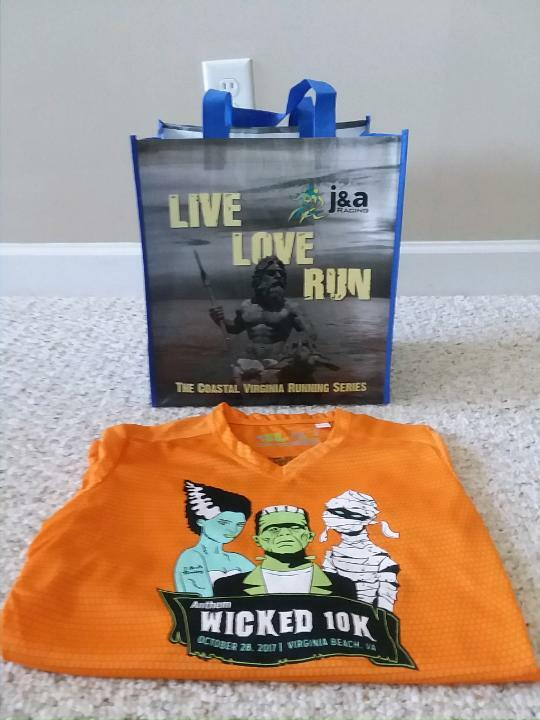 The Wicked 10K sounds so wickeeed! Your outfit looks charming too btw. Glad you had lots of fun. Thanks! It is always one of my favorite races. Seeing the costumes is so much fun for Halloween races. It's why I love having trick or treaters. It's just fun to see what the costumes are each year.